The curtains are very well made and look great. But, they are very stiff due to the blackout backing. I spent a couple hours steaming them to get the wrinkles out. This stylish window curtain panel features a solid pattern and blackout design to add elegance and function to any room. Experience the darkness, silence and beauty of Eclipse curtains. Eclipse blackout panels have been laboratory-tested to block out over 99-percent of intrusive light, unwanted noise and can help you save on home heating and cooling costs. Eclipse curtains offer a unique blend of fashion and function for any home decor. Transform your media room into the ultimate home theater experience, or create ambiance in your dining area. National Sleep Foundation studies show that reduced light and noise are optimal for a better night's sleep. Eclipse Curtains are perfect for the bedroom, kid's room or nursery, providing the ideal sleep environment for the whole family. The magic is in the Thermaback construction. The innovative foam-backing is applied to the fabric and allows you to enjoy all of the light-blocking, noise reducing and energy saving benefits, while providing the same fashionable style and elegance of naturally flowing curtains. Hang two or more curtain panels on a standard or decorative rod for optimal coverage and desired effect. Sold as a single grommet panel measuring 42-inch wide by your choice of 84 inches, 95 inches, or 108 inches long. Grommets accent panel with an antiqued bronzed metal. Available in black, chocolate brown, linen beige, river blue and sage green. Rod sold separately. 100-percent Polyester. Machine wash gentle cycle, tumble dry, do not bleach. Imported. The Eclipse Meridian Blackout Window Curtain Panel is a very well built curtain. It is thicker than any curtain I've seen before, and it has a white outside which definitely helps keep it from heating up when the sun beats in on it. These curtains block the Florida sun and heat nicely. The only downside is the AWEFUL smell! I washed them and they still stink. Heavy duty and nice pattern. Curtains really blackout well. Neighbor has spotlight he forgets to turn off and now the bathroom isn't lit up at night. These block the light but NOT the noise. The reviews about smells nearly scared me off but there was no odor to them. The wrinkles do not go away either but they are really pretty. These are the best panel curtains out there. Can’t believe the quality you get for such great prices. I bought the exact curtain panels in a department store for almost half the price. They definitely block out the light. They can be easily machine washed as needed and come out looking new again. You can’t beat the cost or the quality. So disappointed with my purchase. Very bad quality. Fabric look like plastic. Had to return it. Lovely blackout curtain panel, functions exactly as advertised. 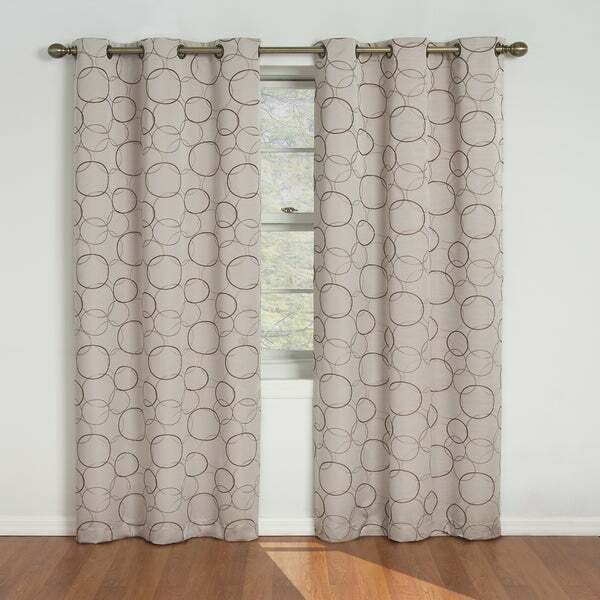 I gave this item a lower rating not for any quality flaws of the panel themselves, but the color of these curtains are NOT linen. The color is much darker and more of a taupe/dark sand. They would have been perfect had they been a true light linen fabric color as they look in the stock photo. Again, not necessarily a bad product but they should definitely change the name to more accurately reflect the true panel color. these curtains are amazing, if you work nights and want to sleep in the day, these are for you!! for the money they work better than any other black out curtain!! The curtains are excellent. Blackout curtains are perfect. Great purchase. High quality curtains. Excellent light blocking. It’s the color. I ordered linen which looks like cream with beiges and browns. It’s grey/green and not even close. The curtains were much nice than I thought they would be! "What color are the circles on Linen color curtains? Thanks!" They are different shades of brown (darker and lighter). "when will you be getting more sage 95" in? there are currently only 3 panels and i need 4. thanks"
"Is the width 42" total for 2 panels or is it 42" for each panel?" This listing is for a single panel. Each panel is 42 inches wide. "What color is the back side of the panel? " "I'm looking for a greyish blue color curtain. Does the River Blue color have some grey to it? The picture looks like it does. " I think they are greyish blue. I have them in my grey painted bedroom and they blend very nicely. It does have some grey in it. I think they look more green than blue. Not what I was expecting based on picture, but still pretty. "Do these have any shimmer to them or are they fairly flat?" "What do the grommets measure at?" 1.5 inches across (inside measurement) at the widest point (so 1.5 inches diameter). I am using these with a 0.75 inch diameter curtain rod which is of course way too small. You could go with a MUCH thicker rod. Hope that helps! Hi what is the color of the main picture the cream color?